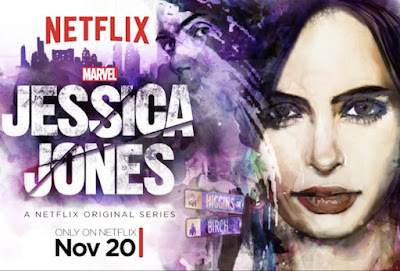 The Pop Culture Podcast by Phantastic Geek: Review: Jessica Jones pilot "AKA Ladies Night"
As we are introduced to Ritter's Jones, her narration instantly sets the tone for the series: the cynical view of a would-be do-gooder. She aspires to do the right thing but can't because of what she's endured at the hands of her tormentor in David Tennant's Kilgrave or chooses not to because it's just too damn enjoyable. She is an alcoholic, bitterly-angry, post-traumatic pill of a present-day woman that Ritter absolutely nails in her finest performance to date. 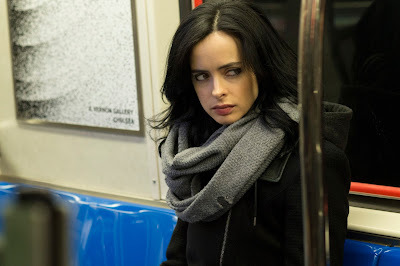 As a private detective in Hell's Kitchen, New York, Jones is barely getting by, occasionally utilizing her powers to make enough money to buy booze. When she lifts the rear end of a car in the process of serving papers for client Jeryn Hogarth (Carrie-Anne Moss), it's played for such delicious dark humor that belief is satisfactorily suspended. But when she takes on a case concerning missing collegiate track athlete Hope (Erin Moriarty), Jones' detached approach to her work takes a decidedly familiar and personal turn. 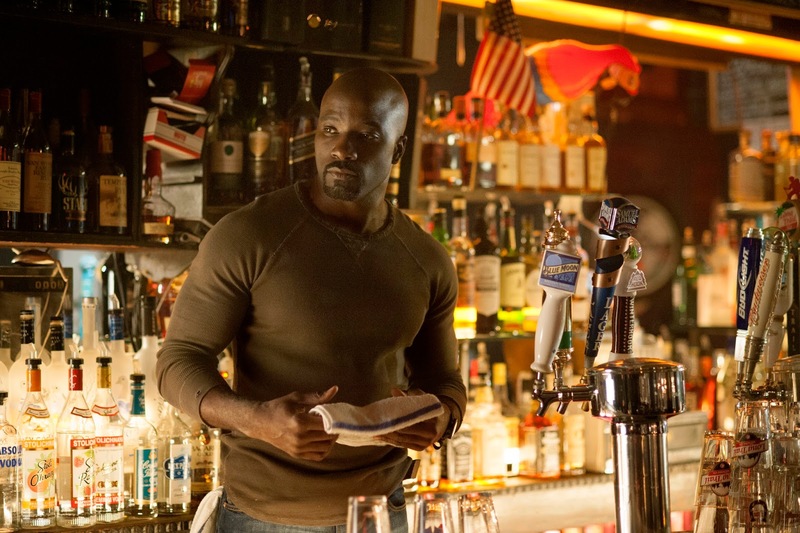 It's that and her burgeoning relationship with neighborhood barkeep Luke Cage (Mike Colter), who gets his own series next year, that further humanize a superhero. Mike Colter's Luke Cage comes to Hell's Kitchen next. 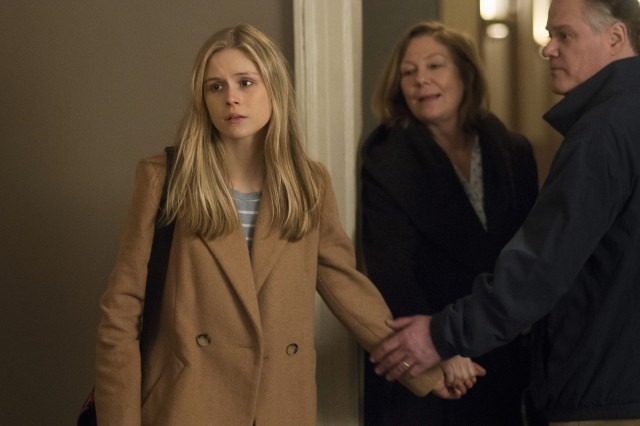 The pilot, "AKA Ladies Night" written by showrunner Melissa Rosenberg, who developed the long-gestating series, hits all the right, heart-breaking notes while also serving to hook viewers. 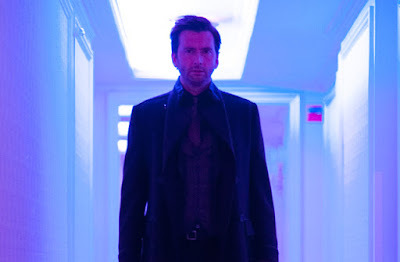 While Tennant barely appears in the pilot, his persona, a la Wilson Fisk in the first few episodes of "Daredevil," looms large in absentia as the psychological threat of his reappearance in Jones' life lurks like a purple-hued nightmare. Highlights from the pilot include a deftly-handled flashback of Jones with Kilgrave, two really good scenes with Cage -- the latter of which really pulls no punches regarding the maturity of this series -- but it's the terrible twist that Kilgrave has weaponized Hope, who murders her parents after Jones thinks she's saved her, that catapults the series forward. Carried by a female cast that will do wonders to advance the genre, "Jessica Jones" is a can't miss. Phantastic Geek will podcast all 13 episodes of the series, releasing episodes each Sunday and Thursday. "AKA Ladies Night" will be released tomorrow night.